Coming soon to a petri dish near you: recordings of dramas that are as compelling as any that would reveal the mysteries of the human heart, only more intimate. When played back, these recordings promise to reveal the events that matter to cells—the molecular experiences that drive development, host-pathogen interactions, pathogenic processes, and much, much more. A trailer of sorts has been released by a team of scientists based at the Wyss Institute for Biologically Inspired Engineering and Harvard Medical School. It’s a brief proof-of-concept movie, a sequence of images that illustrates how DNA can be encoded in—and then played back from—DNA in living cells. The ability to record such sequential events like a movie at the molecular level is key to the idea of reinventing the very concept of recording using molecular engineering, say the researchers. In this scheme, cells themselves could be induced to record molecular events—such as changes in gene expression over time—in their own genomes. Then the information could be retrieved simply by sequencing the genomes of the cells it is stored in. Details about producing cell-level blockbusters appeared July 12 in the journal Nature, in an article entitled “CRISPR–Cas Encoding of a Digital Movie into the Genomes of a Population of Living Bacteria.” As the article’s title indicates, the Wyss/Harvard team relied on CRISPR technology, which is derived from a bacterial immune system. CRISPR helps bacteria to develop immunity against the constant onslaught of viruses in their different environments. As a memory of survived infections, it captures viral DNA molecules and generates short so-called spacer sequences from them that are added as new elements upstream of previous elements in a growing array located in the CRISPR locus of bacterial genomes. The by-now famous CRISPR/Cas9 protein constantly resorts to this memory to destroy the same viruses when they return. Unlike Cas9, which has become a widely used genome engineering tool, other parts of the CRISPR system have so far not been exploited much technologically. One part that could be used more frequently, suggests the Wyss/Harvard team, is the ability to write information into the genome of a living cell by the addition of nucleotides over time. The authors also pointed out that they were able to uncover underlying principles of the CRISPR/Cas adaptation system, including sequence determinants of spacer acquisition that are relevant for understanding both the basic biology of bacterial adaptation and its technological applications. In 2016, scientists lead by Wyss Core Faculty member George Church, Ph.D., built the first molecular recorder based on the CRISPR system, which allows cells to acquire bits of chronologically provided, DNA-encoded information to generate a memory of them in the genome of bacteria as a cell model. The information, stored away as an array of sequences in the CRISPR locus, can be recalled and used to reconstruct a timeline of events. However, “as promising as this was, we did not know what would happen when we tried to track about a hundred sequences at once, or if it would work at all. This was critical since we are aiming to use this system to record complex biological events as our ultimate goal,” said Dr. Shipman, who works with Dr. Church, who led the current study. The Wyss/Harvard team first demonstrated that it could encode and retrieve an image of the human hand in DNA inserted into bacteria. They similarly encoded and reconstructed frames from a classic 1870s race horse in motion sequence of photos—an early forerunner of moving pictures. 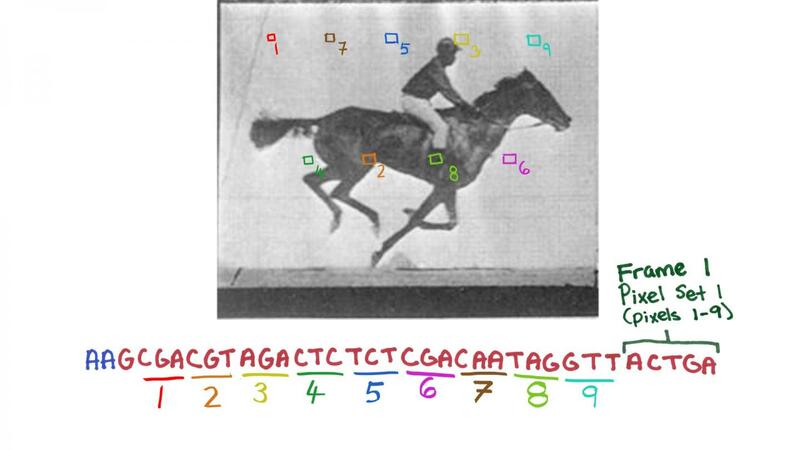 To create this movie, the researchers translated five frames from the original racehorse movie into DNA. Over the course of five days, they sequentially treated bacteria with frame after frame of translated DNA. Afterward, they reconstructed the movie with 90% accuracy by sequencing the bacterial DNA.